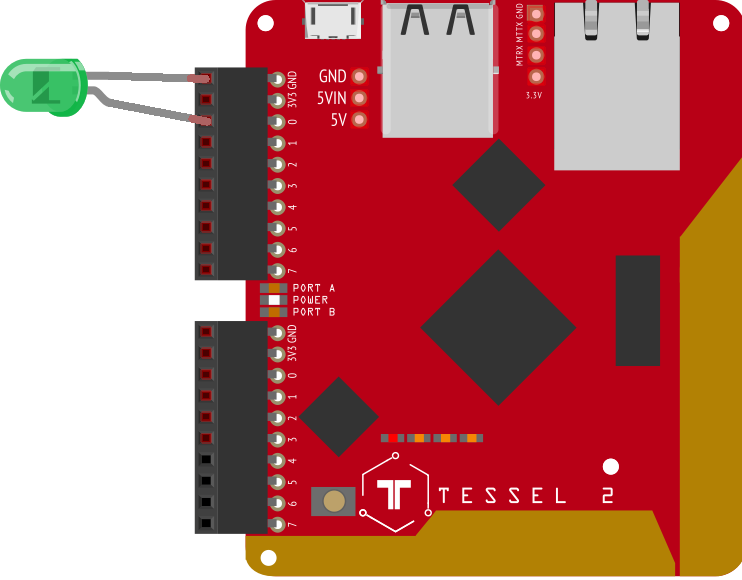 Back in April I wrote about Bocoup’s excitement for the recently announced Tessel 2 in “Pushing NodeBots Into The Future with Tessel 2”. Since then, we’ve worked side-by-side with the Tessel Project to help them realize their platform vision for the next stage in the evolution of the Tessel. With shipping underway, we’re excited to start publishing a series of “getting started” guides that will provide the basic building blocks to create Johnny-Five applications for the Tessel 2. In this first article, we’ll get familiar with writing Johnny-Five programs for Tessel 2 by writing a simple “Hello World,” then explore a couple variations on that theme. If you have any trouble along the way, with either Johnny-Five, Tessel-IO, or the Tessel 2, please ask for help in the Johnny-Five Gitter channel. We need to make sure your Tessel 2 is running the latest OS images and firmware before you continue. Complete all steps in the t2-start guide to guarantee you have the latest Tessel 2 system. If you haven’t already done so, you must complete the t2-start activity before continuing with this guide. Once your Tessel 2 is updated, come back to this article and continue to the next section. Once this is complete, you’ll have the necessary local environment to build your project! Let’s make an LED blink—no more, no less. Require the Tessel-IO module. 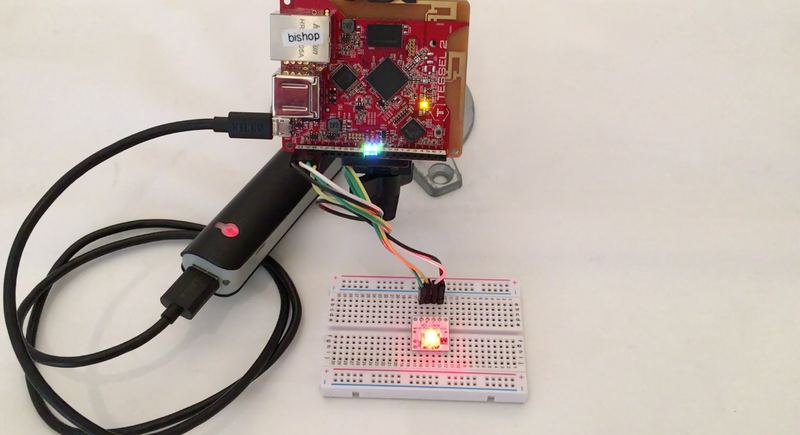 This class is used by Johnny-Five to communicate with the Tessel 2’s SAMD21 coprocessor. Create a “ready” event handler, which is called once Johnny-Five and Tessel-IO have completed any initialization that must be done. Once the board has signaled that it is “ready,” create a new instance from the Led class 0, specifying that the LED itself is attached to PORTA, pin 0 using the shorthand string notation "a0" (Tessel-IO Pin Naming Guide). Call the blink() method of the led instance object, specifying 500ms on-off periods. And of course your LED will be blinking on-off every 500 milliseconds. Whenever you’re ready to move on, shut down the program by sending a signal interrupt (CTRL+C). So far you’ve made a single LED blink, which is very exciting the first time, but trivial none-the-less. Let’s see what it takes to make many LEDs blink. Create a new instance of the Leds collection class, specifying that LEDs will be attached to PORTA, pins 0, 1, 2, 3, 4 and 5, using the shorthand string notation "a0", "a1", "a2", "a3", "a4", "a5". Call the blink() method of the leds instance object, specifying 500ms on-off periods. 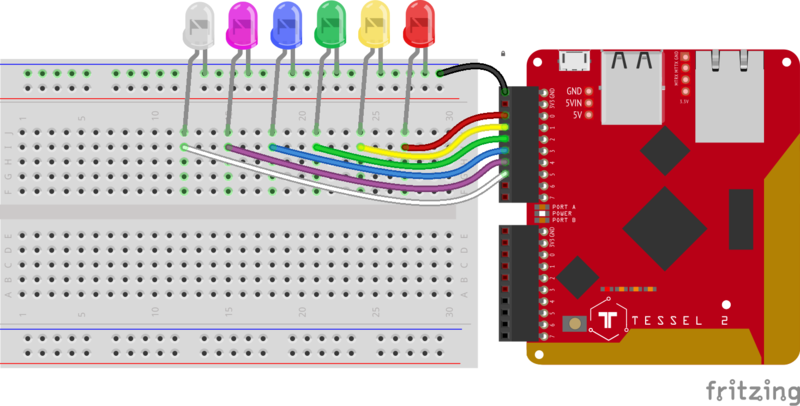 Next, connect your LEDs to the Tessel 2 via the solderless breadboard. Call the off() method of the leds object. This will shut off all LEDs under the control of the collection instance. Call the on() method of the LED located at index of the collection. Increment or decrement the index. For this next project, I’m going to scale back to a single LED—however, the BlinkM is no ordinary LED. This component is an RGB LED controlled via an I2C interface, which means that it requires four jumpers to the board: 3V3, GND, SCL and SDA (SCL is pin 0 and SDA is pin 1, on either PORT). Again, nothing has changed about steps 1 through 5 (note that there are no additional libraries to load), but I’m now using a different component class to control the BlinkM. Note that controller and port values are case insensitive. The address property is optional for all built-in controller objects in Johnny-Five, but the port property is specific to the Tessel IO Plugin. I2C components have specialized internal operations and therefore require a little more information than can be implied by the pin name mapping used in the previous examples. Later we’ll look at an I2C component that has its own pins! Call the color(...) method of the rgb instance object, specifying the hexadecimal color code "#ff0000". 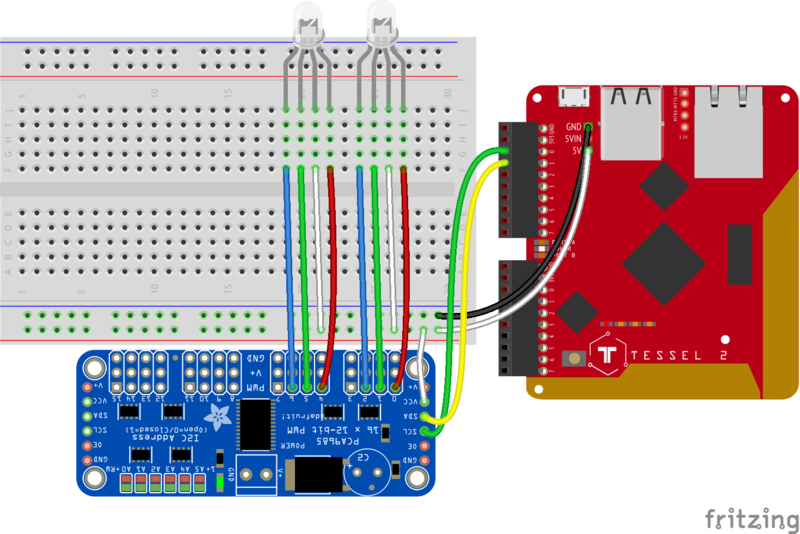 Next, connect your BlinkM to the Tessel 2 via the solderless breadboard. Create a new instance of the Led.RGB component class—you’re already an expert in this, so no more discussion is needed. Declare and assign values to three variables: level to 1, interval to 10 (10ms = 100Hz) and step to 10. level will track the value of the intensity level from 0-100%, interval is the time in milliseconds between each loop iteration, and step is the number to increase or decrease on each iteration. Call the color(...) method of the rgb object with hexadecimal color code "#ff0000", then chain a call to the intensity(...) method with value 0. This will set the color to red, but the intensity level will be 0, so it will initially appear to be off (not that your slow human eyes will ever notice). If the level has gone over 100 or under 0, invert the step value. Call the intensity(...) method of the rgb object with the result of adding the step value to the present level value. The initial values of level, interval and step have changed to 100, 5 (5ms = 200Hz) and 1, respectively. In addition to level, interval, and step, nulls is declared and assigned to [null, null, null], which will be used to generate new arrays of unsigned 8-bit integer (uint8) values that are passed to color(...). Call the intensity(...) method of the rgb object with level. Call the color(...) method of the rgb object with a new array of uint8 values. I’m going to swap out the BlinkM with two diffused RGB LEDs, which will be driven by an Adafruit 16-Channel 12-bit PWM/Servo Driver (PCA9685). The driver is required here because the Tessel 2’s firmware does not yet support direct PWM output. The “pulsing” color change pattern will remain, but it will be used for both LEDs. Initialize two Led.RGB instances, both with isAnode: true and appropriate pins. The order of pins in the pins array corresponds to [ red , green, blue ]. Call the intensity(...) method of both the left and right objects, with the initial value of level. Call the color(...) method of both the left and right objects, with an array of uint8 values returned by randomRGB(). Call the intensity() method of both the left and right objects, with the updated value of level. Define a function called randomRGB(), which will return an array containing 3 random uint8 values. So far I’ve limited the “voice” of my Tessel 2 to LED demonstrations, which are fun but also relatively trivial. The title of this article is Say “Hello World” with Johnny-Five on Tessel 2 and my goal is to deliver exactly that. In this section, I will show how to “say” the words with a digital display and a Tessel 2. Create a new instance of the Led.Digits component class, setting the controller property’s value to "HT16K33". Call the print(...) method of the display object, with the string “Hola”. // Coming soon in ES7: String.prototype.padLeft! Declare and assign values to two variables: message to "Hello World" and index to 0. message is obviously the string characters that will be shown on the display, and index will be used to track that starting index for each iteration. If the length of chunk is less than the 4 (the number of characters that can be displayed at once), then concatenate an empty space (" "), followed by a slice of the message string, from the beginning to whatever the difference of 3 (the remaining number of characters after the empty space) and the present chunk.length. This is how the display will appear to “cycle” the contents of message in from the right edge to the left edge. Call the print(...) method of the display object, with the string contents of the chunk variable. If the index is greater than the length of message, set index back to 0. This is how the display will appear to “cycle” the contents of message infinitely. This article has shown several different ways to convey some kind of information from a program running on a Tessel 2 to the outside world, but the capabilities don’t end here. Think about how a program might convey information that is relevant to the environment surrounding the device itself. Consider displays you might take for granted: microwave, stove, digital clock, remote control, and game pad indicator lights. What about the difference between text based “notifications” versus simple indicator lights that have some meaning assigned to them. What are the pros and cons of each?